Hello sports fans. Let me introduce to you the absolute best collection of sport and board games. This ultimate recreational kit is one of a kind and is the biggest and best collection of sporting goods and popular board games ever assembled. It is a collection put together by esportsonline and will satisfy the sporting and toy needs of your kids or organization for years to come. This recreational kit is an all in one purchase. It is suitable for families, church groups, schools, boys and girls clubs and any organization that wants to keep their members entertained, healthy and having fun for hours, days and years. All the sports equipment for any sized group is included. Rainy days……no problem, the selection of popular indoor games is awesome. 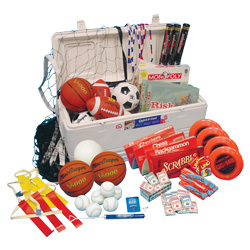 If you run a club or activity centre, this recreation kit will be a one stop shop. Here is a list of equipment that comes in the kit. At the time of this writing the kits are priced at 20% off with free fedex shipping. eSportsonline carries equipment for every sport including baseball, basketball, football, lacrosse, soccer, softball, tennis, volleyball, gymnastics, weight lifting, archery and much more.